We offer a variety of air conditioning services that will keep you and your family cool and comfortable in Davidson, NC. Surviving the heat and humidity of a Davidson, NC summer means doing everything you can to ensure that your air conditioning system works efficiently throughout the season. At Cool Comfort Heating & Air, we offer a variety of air conditioning services that will keep you and your family cool and comfortable, including keeping you from getting hot and angry about your utility bill! Air Conditioning Maintenance – Maintenance is your first defense against problems and high utility bills. Call us before summer gets into full gear, and we’ll inspect your system and perform maintenance air conditioning services to make sure it is running as efficiently as possible. We’ll inspect for potential problems, so they can be resolved before they become larger ones. This saves you a repair call, as well as the fact that a small part now can sometimes save you a more expensive repair bill later. Air Conditioning Repair – While maintenance can prevent many breakdowns, some things can still happen unexpectedly. And, thanks to Murphy’s Law, they will often happen in the evening or over the weekend. Have no fear, however, because our emergency air conditioning services are available 24/7 for your convenience. Our dispatch works promptly to get you the help you need, and our service vehicles are well-stocked, so in most cases, your repair can be done in just one visit. 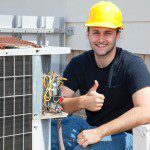 Air Conditioning Installation and Replacement – Our air conditioning services also include putting in a new unit, whether that is for new construction or to replace an aged unit. We welcome the chance to show you the dollars and cents that will help you in the decision about replacing an older unit with one that is more energy-efficient, and we offer numerous financing options to make it easy to manage. Your utility savings will go a long way toward paying for your new unit. Whatever air conditioning services you need, give us a call. We will do our utmost to make sure you, your family, and your budget are all nice and comfortable throughout the summer season.